In an established neighborhood of wonderful homes this spacious ranch is on 2+ magnificent acres with 20 X 40 foot in- ground pool and an additional 2000 sq ft. out- building with endless possibilities. Improvements include newer roof, many windows, an irrigation system for the gardens, finished walk- out lower level with den/office and rec. room. (Picture a home theater there.) 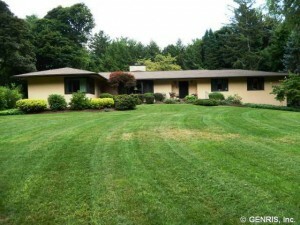 This home is attributed to the well-known mid-century modern architect Don Hershey.